Differential code biases (DCBs) account for the most significant systematical biases when sensing the earth’s ionosphere with GNSS observations and are also important correction parameters in GNSS applications of positioning, navigation and timing. With the continuous modernization of the American GPS and Russian GLONASS systems, and also the rapid developments of the European Galileo and Chinese BeiDou systems, there is a strong demand of precise satellite DCB products for multiple constellations and frequencies. This study proposes a new method for the precise determination of multi-GNSS triple-frequency DCBs, which can be divided into three steps. The first step is to precisely retrieve slant ionospheric delays and “additional code biases” based on a newly established full-rank triple-frequency precise point positioning (PPP) model with raw observations. Both the slant ionospheric delays and “additional code biases” containing the DCBs need to be estimated. Then, an enhanced IGGDCB (IGG stands for Institute of Geodesy and Geophysics) method is used to estimate the DCBs between the first and second frequency bands with the PPP-derived slant ionospheric delays. At last, the previously estimated DCBs between the first and second frequency bands are substituted into the “additional code biases” and DCBs between the first and third frequency bands are estimated. Multi-GNSS slant ionospheric delays from the triple-frequency PPP method are compared with those from the traditional dual-frequency carrier-to-code level (CCL) method, in terms of formal precision and zero-baseline experiment. Quad-system average formal precisions are 0.08 and 0.41 TECU, for PPP and CCL methods, respectively, indicating the obvious improvements of PPP over CCL. One month of data from 60 globally distributed multi-GNSS experiment stations are selected, and totally eight types of DCBs are estimated for GPS, GLONASS, Galileo and BeiDou. Multi-GNSS satellite DCBs generated with the proposed method are compared with the products from different agencies, including Center for Orbit Determination in Europe (CODE), Deutsches zentrum für Luft-und Raumfahrt (DLR) and Chinese Academy of Sciences (CAS). For GPS C1WC2 W DCBs, RMS values with respect to CODE products are 0.24, 0.07 and 0.09 ns for DLR, CAS and IGG (this study), respectively. RMS values are 0.31/0.25 and 0.19/0.15 ns, for GPS C1WC5X and C1WC5Q DCBs and with respect to DLR/CAS, respectively. For GLONASS C1PC2P DCBs, RMS values with respect to CODE are 0.68, 0.49 and 0.33 ns for DLR, CAS and IGG, respectively. For Galileo, RMS values are 0.16/0.20 and 0.13/0.14 ns, for C1XC5X and C1XC7X DCBs and with respect to DLR/CAS, respectively. For BeiDou, RMS values are 0.32/0.25 and 0.34/0.41, for C2IC7I and C2IC6I DCBs and with respect to DLR/CAS. These results show that the proposed method can provide multi-GNSS and multi-frequency satellite DCB estimation with high precision, processing efficiency and flexibility. 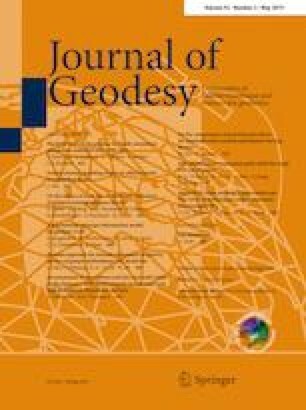 The authors would like to acknowledge the IGS MGEX, Curtin University, GNSS Research Center in Wuhan University, iGMAS, DLR and CODE for providing access to the multi-GNSS observation data, post-processed satellite orbit/clock products, DCB products and GIM products used in this study. Funding supports from China Natural Science Funds (No. 41804037 and 41674022) and National Key Research Program of China “Collaborative Precision Positioning Project” (No.2016YFB0501900) are also gratefully acknowledged. The second author is supported by the CAS Pioneer Hundred Talents Program.